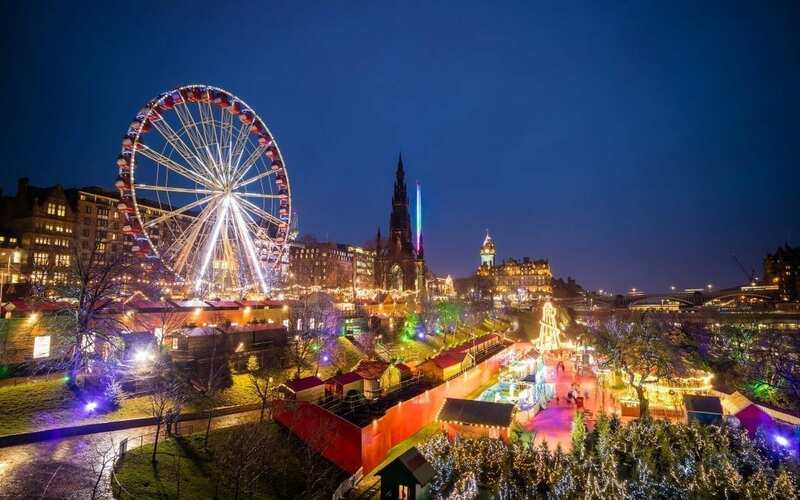 Over six weeks, Scotland’s Capital city transforms into a magical winter wonderland. The city offer no shortage of things to see, do and enjoy with a programme designed to get you into the Scottish festive spirit. Breather in the scent of Christmas with a stroll though the city’s cinnamon-fueled markets, a mug of glühwein or hot chocolat in hand. Marvel at twinkling ice sculptures celebrating some of Scotland’s most famous citizens in the Ice Adventure, visit the Gian Advent Calendar, or treat yourself to a spectacular show at the Festival Square. For festive thrill seekers young and old, discover the Star Flyer and the Yeti, take a spin on the the Big Wheel and Carousel, and don your skates on the oval Ice Rink. Forget the Christmas coffee cup or the first mince pie – the switch on of the High Street lights marks the true beginning of the festive season. Visitors and residents came together to celebrate the start of Edinburgh’s Christmas season. The festivities, which will last for six weeks, went into full swing as a 20,000-strong crowd met in the city centre for an afternoon of free music, dance and celebrations. Alongside the opening of the annual markets in Princes Street Gardens, the event marked a weekend where families across the city began to prepare for the big day. Tonight’s event, dubbed Light Night, is the latest in a line of attractions designed to foster community spirit on George Street and the surrounding areas. Throughout the afternoon, choirs and dance groups came from across Scotland and braved the freezing winter weather to perform.